Two days ago, Paul Sherman, developer of Absolute Linux, announced the immediate availability of the Absolute Linux 12.1.09. This version comes right after the 12.0.8 release, which was baked and delivered on October 11th. Absolute Linux 12.1.09 fixes three bugs and updates one package. · The first bug fix is for the TiLP package, which had some permissions set incorrectly for the /usr/share/applications directory. This caused to render useless .desktop files for the regular user accounts. · The second bug fix resolves the desktop file type association for .gz files. · Last but not least, the linking problem between Mozilla Thunderbird mail client and Mozilla Firefox web browser (the mailto function in Firefox and url function in Thunderbird) was fixed in this release. Moreover, Absolute Linux 12.1.09 updates the "absolute" theme in the gtksourceview2 package, so you can use even more visible colors for the mouse cursor. · Manuals, HOWTOs and other useful documentation. 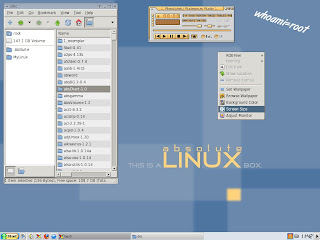 If you want a fast, lightweight, Slackware-based Linux operating system for your personal computer, you can download Absolute Linux 12.1.09 right now from here.